When one mentions Mediterranean foods, what are the first things that come to your mind? I know, it’s probably something like pizza, olive oil, fish, and a plethora of seafood. These thoughts appear rightfully so since the previously mentioned foods are delicious and worthy mentions of this region’s cuisine. But, today we would like to talk about one unfairly overlooked and amazing food item – the flatbread. If you’re thinking about hard, dry, bland crackers, then I assure you that you couldn’t be further from the truth. We’re talking about soft and flavorful, handmade breads topped with a series of different condiments and ingredients. 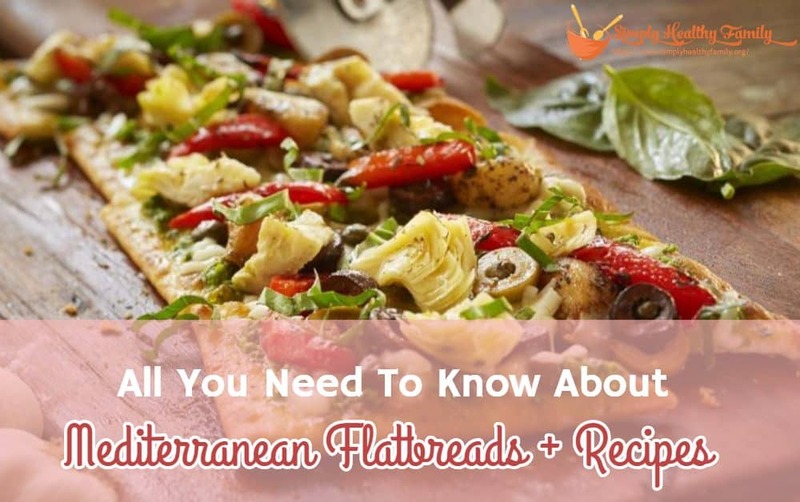 Flatbreads are present in many Mediterranean cooking traditions, and we’ll mention a few examples. The Greek pitas are used as wraps for delicious meats, and North African mana’eesh is usually topped with cheese or lamb. 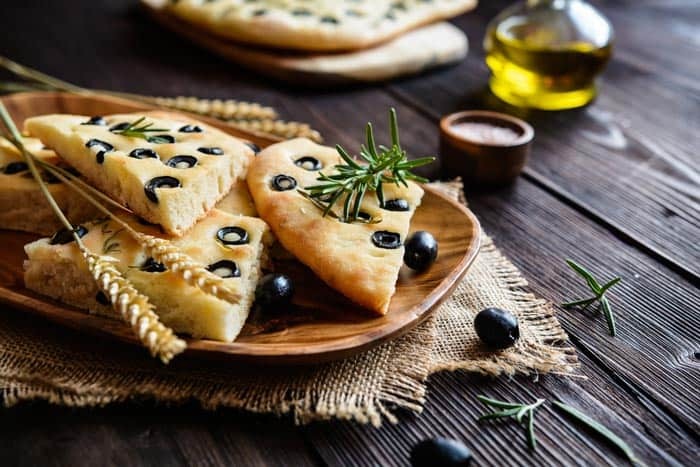 Italian airy Foccacia is rich with olives, sprinkled with herbs, or can even be made into a sweet version with fruits. For those who love juicy and rich toppings, we would recommend the French pissaladiere which is packed with caramelized onions and anchovies. 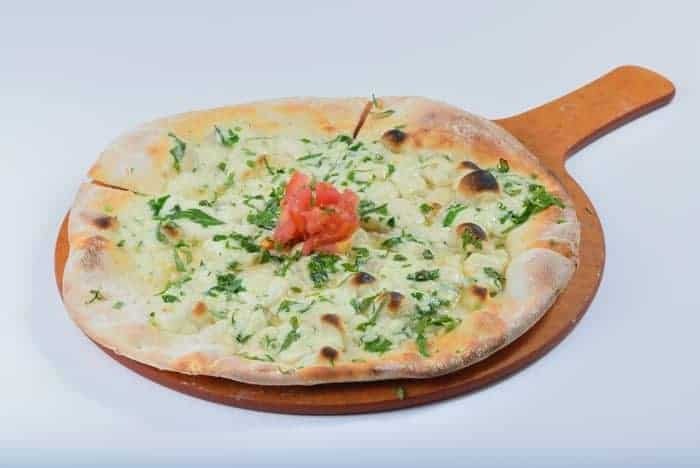 As you can see, the styles and culinary uses of flatbreads can greatly vary, meaning that they can be an ideal side dish for a number of main courses, the main course by themselves, or delicious starters and snacks. Since there is so much diversity in case of this food item, we decided to handpick the best Mediterranean flatbread recipes in our humble opinion. Each of these come from a different country and have different flavors, so there’s no better advice than to try them all out and see which suits you the most! This bread is a perfect, warm and tasty addition to your dinner. It’s super easy to make, and all the ingredients you need can be found in the pantry. It can be made with any kind of olives, and they will do a fantastic job of adding flavor to the dough. Sprinkle with salt and drizzle with olive oil before serving. 1. Place the flour and the yeast in a large bowl. Make a well (a hole in the middle of the flour), then add water, oil, and salt, and start mixing the flour in using your fingertips. When you form the dough, start kneading it and continue to do so for about 15-20 minutes. 2. Chop the pitted olives and add them to the dough. After that, mix it again, form it into a ball, and let it sit covered in a warm place for about 40 minutes. 3. After the dough has rested, start pushing the air out with the palms of your hands. 4. Spread a little bit of flour over your working surface and place the dough on it. Using a rolling pin spread the dough to about 1 cm thickness. 5. Cover the baking sheet with parchment paper, place the dough on it and let it rest for another 40 minutes. 6. Preheat the oven to 420 degrees Fahrenheit. 7. Press in little holes with your fingers all over the dough, then pour some olive oil into them and bake for 25-30 minutes. We are pretty sure that pita doesn’t need any special introduction. If you’ve ever eaten gyros or a falafel wrap, then you know what it is. This flatbread is ideal as a wrap, but that is not its only purpose. It can also be served with curries and grilled meats of all sorts. Pita is a great base for inventing new dishes too. 1. Pour water in a bowl, add yeast to it, and wait until it dissolves (approximately 5 minutes). 2. Add 300 grams of flour, salt and olive oil to the mixture, and mix it until you get a dough. 3. Take a little bit of the remaining 60g of flour and sprinkle it over your working surface. 4. Start kneading the dough and add flour whenever you need to stop the dough sticking to your hands. Remember to add extra flour sparingly, since it is better to add too little than too much of it in this case. Knead for about 5 minutes. 5. Place the dough in a bowl, cover it with a cloth or some plastic foil, and let it grow for about 1-2 hours. 6. Take the dough and put it on a floured surface, then split it into 8 equal parts. 7. Using a floured rolling pin, roll out the dough balls into circles with a diameter of 15-17cm. If the dough starts to stick to the surface sprinkle it with more flour. After rolling the pitas, let them sit for a few minutes. 8. Preheat the oven to about 450 degrees Fahrenheit. It would be ideal if you had a baking stone, but if not, a regular baking sheet with parchment paper will do just fine. 9. Place the pitas (as many as you can fit) on to the baking sheet and bake for about 3 minutes. 10. Take the pitas out of the oven and bake them on a medium heat skillet with a bit of oil. 30 seconds on one side, 1 minute on the other. In case you’re wondering what this is, mana’eesh is a flatbread made in the Middle East and North Africa. On the first look it looks plain and simple, but if you have a bite, you will discover a new taste of eastern, marvelous flavors. It can be topped with lamb or cheese, or just eaten by itself. This flatbread is chewy, and its texture is similar to that of a very good pizza crust. Za’atar is a herb used to season the dough, and it comes from the same family as oregano, basil, and thyme. Along with some olive oil, it makes an awesome combination. 1. Pour 100 milliliters of warm water into a bowl and mix in the yeast and sugar. Let the mixture sit for about 15 minutes. 2. In a separate bowl, beat the eggs until they are just mixed. 3. Add ¾ of the total flour into a food processor along with the salt, and pulse it a few times. This is done so that the flour gets some air. 4. Turn on the processor and slowly add the eggs. After that add the 170 milliliters of water and the water/yeast mixture. Let it mix well. 5. Gradually add the remaining flour to the wet dough until it forms a solid bowl that moves around the food processor. You may not need to use all of the flour. 6. Take the dough out from the processor and start kneading it with some extra flour. Knead until you form a nicely shaped ball. 7. Put the dough ball in a bowl coated with olive oil, then cover with a cloth or plastic wrap, and let it sit for about 2 hours. 8. Preheat the oven to 400 degrees Fahrenheit. 9. Take the dough and divide it into 12-14 pieces. 10. Oil up your hands and form thick little circles with the dough. The dough should feel ‘relaxed’ under your fingers, and if it doesn’t, leave it for about 10 minutes and try again afterward. 11. Brush the mana’eesh with olive oil and sprinkle with za’atar. 12. Place it on a baking sheet covered with parchment paper and bake for about 13-17 minutes, until golden brown. People of all Mediterranean nations are known to be kind, sociable, open, and warm as the weather they live in. 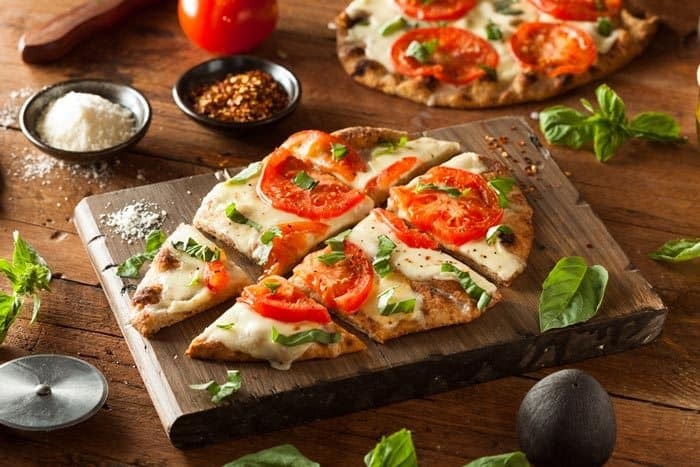 The flatbreads from this part of the world carry a piece of this tradition with them, and maybe that’s why folks from all over the globe love them so much. Or, maybe it’s just because they’re so delicious! Whichever the case, we would advise you to try out any of the recipes we provided that resonate with you. 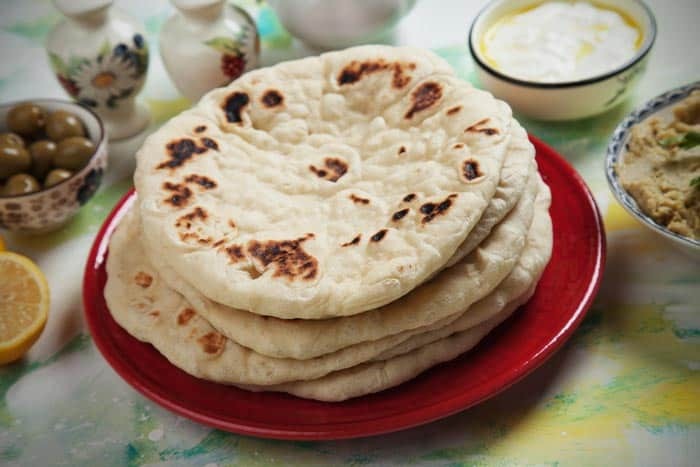 No need to go to overpriced restaurants when you can easily bake your own flatbreads at home. Gather up your family or friends around your dinner table and enjoy some quality time with them, because the Mediterranean spirit teaches us about the importance and joy that people can give to each other. We leave you with this thought, so, until next time – bon appétit!